KC-Conference with Alexander Khalifman: Part Three. The KC-conference with the 1999 FIDE World Champion, grandmaster Alexander Khalifman, attracted a great deal of interest. A record number of questions were submitted. We expected that kind of interest, and foresaw the need for a “completion” of the conference, giving our forum participants a chance to pose supplementary questions. [Translator’s Note: “Completion” is meant here in the sense of the completion of an adjourned game.] Today we are publishing this resumption of the “folk interview” of our ninth guest. This time we have not grouped the questions and answers into categories, but have left them in the order in which they were submitted. Lehabey: Were you able to visualize the chess board and position well from the very beginning of your chess career, i.e., were you able to see and analyze the position with your eyes closed? Or did this ability develop over time, and your vision of the chess board become more and more clear? What about your students? At what level of play must a chess player be able to play with his eyes closed? How can one develop this ability? As far as my students are concerned, I am not at all certain that this ability directly correlates to an ability to play chess. In other words, sometimes a very strong grandmaster plays blindfold fairly weakly, and the other way also happens (as the results of the Amber tournaments confirm). I don’t think there is any particular necessity to develop such an ability. Either you have it or you don’t. By itself, blindfold chess is a dead-end branch. - Alexander Valerievich, do you think that the leading chess players should serve as role models for the upcoming generation? That is, as a model not only in chess, but also in life, in their attitude toward the sport, their family, their friendships, and so on. So that parents would see such chess players and would want to encourage their children to take up chess as a sport. - And also, do you agree with the assertion of certain great chess players that only chess players with positive personality characteristics (that is, not “rotten people”) can achieve outstanding success? I will have to brush this question off as a provocative one from the beginning. After all, everybody knows that Anatoly Evgenievich [Karpov] and Garry Kimovich [Kasparov] (not even to mention Robert James [Fischer]) are paragons of moral beauty and purity. In my time, only Anand and Kramnik have achieved those kinds of outstanding successes while preserving those same moral compasses that you refer to. I apologize in advance to anyone whose successes I consider to be not so outstanding or whose compasses I consider to be not so moral. Veniki: Tell me about Morozevich, please, both as a chess player and as a person. Probably only somebody who knows Morozevich well could talk about him as a person. But there aren’t so many of those people. Sasha is always so closed and mysterious, and only allows a very few people closer than a certain distance from himself. As a chess player he is very brilliant and nonstandard, which is evident in everything, from the construction of his opening repertoire to the direct algorithm he uses for making decisions. It seems to me that a certain crisis has been evident in his play recently, which is associated with this. Often it’s not enough for him just to make a good move, he has to play “in the style of Morozevich,” and that artificial approach is far from being justified in all cases. By the way, it’s even worse when other chess players start to imitate him. You’ve really got to watch out for that, because in order to play like Morozevich, you have to be Morozevich. E-not: Why can’t you officially sell titles – GM, IM, etc. – if people want to buy them? However, given the existing vector of development of FIDE I would not be at all surprised if it comes to that eventually. - At one time you were a trainer of the Estonian team. What do you think about the general status of chess in Estonia? Is it already hopeless, or still hopeless? I hope to work a little bit more in that region. In general I am very fond of the Baltic nations. Nowadays that has somehow become unfashionable [in Russia – Ed. ], but I can’t do anything about it. The general state of chess, in spite of the constant conflicts between the Estonian Chess Union and the corresponding ministry, is nevertheless more encouraging than not. After all, Keres is still a national symbol of Estonia, and that will not disappear, no matter what passing moods certain functionaries may have. - Are you on friendly terms with any of the Estonian chess players? I think I have more or less good relations with all of the leading Estonian players, but that is already another generation. And then there's Jaan Ehlvest, whom I do not consider to be an American no matter what letters might be next to his name in the rating list. I have associated with him for a very long time and we have been in all sorts of scrapes together. - Which game played so far in 2010 has etched itself into your memory most clearly? If possible, comment on some of the most impressive moments in that game. (E) St. Nicholas’ Naval Cathedral and the surrounding area. - What is the most paradoxical move that you have ever seen in a real chess game? Hmm, that’s not so easy… to me, the move f2-f4 after 1. e4 e5 is more than paradoxical. After 40 years I am still amazed by it. P.S. I mean this absolutely seriously. E-not: Although people say that chess is an art, it is still “computable.” The fact that programs can play better than humans suggests that maybe the concept of a “beautiful game” can be given some sort of quantitative evaluation. What kinds of characteristics of the position, what kinds of moves could lie at the foundation of such an evaluation? When it become possible to formulate and evaluate beauty, then no beauty will remain. Some signs of this fact are already apparent. Once upon a time, the words “The grandmaster sacrifice a knight” would have raised the roof in front of an awed public. Now, the audience watches the game together with a joint and a beer Rybka and Fritz, and they will most likely be worn out by the grandmaster’s protracted deliberation over a completely obvious sacrifice (from the point of view of our electronic advisors). I don’t know how to formalize “objective” beauty. I advise you not to get wrapped up in this. Just be satisfied with what your personal, subjective taste tells you. Extor: Hello, Alexander. Since you studied in the “math-mech” [Translator’s note: The popular abbreviation for the Mathematics-Mechanics Department] at LGU [Leningrad State University] I have the following questions. Do you think that mathematical thought and chess thought are in some way alike, or are they completely separate things in your view? Did a mathematical viewpoint on the world help you in your chess career? Or the opposite? Did you sense that the exact sciences were your calling, or did you enroll in that department simply out of inertia? Let’s say that a certain correlation exists between mathematical abilities and chess, but nothing more. That is, while most chess players have decent mathematical abilities, I have nevertheless met even strong grandmasters, for whom the Pythagorean theorem is a mystery hidden behind seven seals. For me personally, some mathematical habits and techniques may have helped, but not very substantially. When I enrolled in “math-mech” I did sense some attraction toward math, but at the same time I did it out of inertia, because I already suspected that my future would more likely be connected with chess, and it would be extremely difficult to combine one and the other. Seregaaa: How can I learn to play chess on a grandmaster level? I get the humor. What to say as a serious answer, I have no idea. Roman Efimov: Alexander Valerievich, hello! - Please tell me your opinion about Valery Salov: what are his strong and weak points as a chess player, and did he fully realize his abilities? Why, in your opinion, did he stop playing in competitions? Do you still keep in touch with him? (It seems as if he is still living in “Piter”)? Valery had a very inconvenient style (as far as I was concerned): a drawn-out positional style, accumulating and using tiny positional advantages. And, without doubt, he achieved a high degree of mastery this way. His relatively weak sides showed themselves in the opening and in irrationally sharp positions. Of course, his accomplishments were not insignificant, but in my opinion he quit too early to talk about achieving his full potential. No, I don’t really have anything to do with him, which would be quite difficult because of his peculiar historical and political views. - And another thing, please describe Michael Adams and Nigel Short as chess players: their strong and weak sides. Why do you think that Adams dropped out of the elite level two or three years ago? What is he missing now? Nigel undoubtedly had the more brilliant talent, and in sharp dynamical play he was one of the very top players of his time. Michael has a completely different approach, somewhat reminiscent of Valery Salov, whom I just wrote about. - I would also like to ask you to characterize as chess players: Evgeny Bareev, Sergey Rublevsky, Vadim Zviagintsev, Alexey Dreev, Peter Svidler. That’s quite a lot to do in one fell swoop. I respect all the colleagues that you have just mentioned. However, I am not prepared to give extended characterizations, partly so that I don’t offend anybody accidentally, because I constantly associate with them. In terms of the brilliance of their talent, Alexey and Peter stand out even in comparison with this more than worthy crowd, but something has kept each one of them from achieving greater success. For some it was excessive sensitivity, for other a lack of the necessary self-discipline, for others it might have been something else. WinPooh: Alexander, do you agree with the widespread opinion that earlier (say in the “golden age” of chess—the second half of the 20th century) the strongest chess players were interesting as people outside of chess, while today’s “sportsmen” are in this sense diminished? I think this is just carping. Of course, there are a couple of factors that may have encouraged such a “widespread opinion.” The first is that professional chess has gotten younger, after all, and often our attention is focused on youngsters with all of the virtues and vices that are present at that age. Their thinking patterns sometimes demonstrate, let’s say, a certain immaturity, but this is only an age-related phenomenon. The second thing is that we live in an age of narrow specialization, and in chess (and not only in chess) in order to reach the top, you need much more goal-oriented, highly specialized work than even 30 years ago. Correspondingly there is less time and energy for everything else. But in general, I would say that the percentage of bright and interesting personalities in chess remains at the same high level. phisey: This site for tournament results (www.chess-results.com) is updated with new tournaments several times a day. - Does this mean that there are more tournaments in the world than there were, say, 20 years ago? Or does it only seem that way because of the Internet (that is, the greater availability of information)? Has the number of elite tournaments grown? In order to give an appropriate answer for this question I would have to do some serious analytical work, which I hardly have time for at the moment. Judging from chess-results.com, most likely, is not really fair, because 20 years ago there was no such site, and nevertheless people did play blitz tournaments in lots of little towns with populations of 50 thousand. I can only give you my impressions, which I emphasize again are in need of statistical confirmation or refutation. The number of tournaments has probably grown, but roughly in the same proportion as the number of strong chess players. The same thing is roughly true of elite tournaments, although that is of course quite a subjective concept. - I would like to get your opinion of “shvedok” (“Swedish chess”) [this is Russian name for “Bughouse chess” also known as Siamese or Tandem chess - Ed.]. (1) Have you ever played it? (2) Do you agree that by playing this form of chess, young chess players at the 2nd or 3rd category level could improve their tactical vision? I only played it in the distant past, that is, 30 years ago. As far as tactical vision is concerned: maybe it can develop it, but in a fairly idiosyncratic way. Just think about a “Swedished-up” boy sitting at the board in a tournament and thinking: now if I just put a knight on f6, I’ll have a mating attack. Only there is one problem: there isn’t a knight on the board, and the rules don’t allow him to take one from another board. To sum up, I think that there is no particular harm, and if someone likes it, let them play that way. But within reason. MS: Alexander, thank you very much for the KC-Conference: you have been an extraordinarily interesting person to talk with! - I am curious about your authorial plans. I’ll start, if you don’t mind, not with a question but with a wish: write about the endgame! To be honest, I have not read your opening books (and I don’t read other opening books either—it’s not the right food for this horse), but if you write an endgame book I promise to buy it. Your endgames are interesting, and you tell a good story. I don’t have any particular plans yet, but I will take your wish into consideration. It is tempting to write a good book about endgame themes, but very complicated. - Please tell us about two or three of your most memorable endgames that have not appeared in collections. Again, the first ones that come to mind are the missed opportunities: two easily won rook endgames against Anand (Groningen – 1997 and Delhi – 2000), which in both cases I managed not to win. Of the games where I actually succeeded, I immediately remember the endgame against Gulko (Moscow, 1990). - Tell us a little bit about chess in “Piter” in your youth. Can you talk about a “Leningrad school”? How do you see the roles of Spassky, Korchnoi, and Taimanov in the chess live and, in general, the cultural life of Leningrad? Oh, it’s not easy to remember. “Some are no more, and distant… others” [This is a line from Pushkin’s “Eugene Onegin” (tr. by James E. Falen) – Ed.] There was and still is, of course, a Leningrad school. I was too young to catch Boris Vasilievich [Spassky] and Victor Lvovich [Korchnoi] in their home city, they had left for distant parts before I more or less grew up, but I did have the opportunity to play with Mark Evgenievich [Taimanov]. Their role was, of course, very great, and at least for chess in “Piter” they are still a landmark up to the present. - Soccer. The Dutch. I share your passion! But … can you really appreciate Cruyff’s team from 1974, probably the most remarkable European team of the last 40 years? Of course, I remember that team only in fragments, it is most likely just an impression from childhood. But I remember the team of Gullit and van Basten very well, and this also was, in my opinion, one of the outstanding periods of Dutch soccer. - Finally, your comment about instructional lectures. I would like to catch out on something you said. In connection with video commentaries you called this an “architectural extravagance.” I was slightly shocked by this. I could understand it coming from а viewer or reader who reads faster than he can listen. But don’t you think, as a lecturer and storyteller, that this form of delivery multiplies your productivity? Wouldn’t it be easy to deliver a lecture on our site straight to the ether? I will take care of the technical side myself. I think you have lots of things to talk about. It’s up to you, readers and viewers, to decide. It seems to me personally that the extra video-information only distracts me from what is going on directly at the chessboard, but some people might like it. As for giving a lecture myself, for now I don’t know what to say. stirlitz: Alexander, how do you evaluate the results of the tournament in Medias, especially Magnus Carlsen’s play? There is nothing in particular to evaluate, the tournament ended more or less as one would expect. 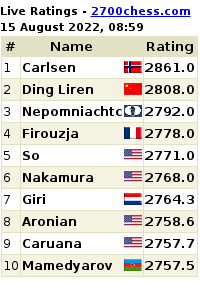 Carlsen confirmed that his very high caliber of play continues to grow. His approach to the game and his confident play made an especially good impression, particularly in his games as Black with Nisipeanu and Ponomariov.